Ecologists are concerned with ecosystems as a whole, the abundance and distribution of organisms (people, plants, animals), and the relationships between organisms and their environment. Ecologists usually choose a specialist area, such as freshwater, marine, terrestrial, fauna or flora. An ecologist may be involved in environmental impact assessments, collect and manage biological information for national databases, or produce comprehensive lists of species that need to be monitored and protected. Why did you choose conservation? I have always been very passionate about the natural environment. The move towards conservation therefore seemed a necessary and logical move for me. What training did you undergo? All my training took place at the University of KwaZulu-Natal. I completed a three-year Bachelor of Science (BSc) degree in Biological Sciences, a one-year BSc Honours degree in Marine Ecology, and a two-year Master of Science (MSc) degree in Estuarine Ecology. The MSc coincided with an internship at the eThekwini Municipality’s Environmental Planning and Climate Protection Department (EPCPD). Is experience as important as formal training? Quality education is vital! All my decisions have to be scientifically defensible, which is knowledge that can only be gained while studying. In attempting to conserve natural areas, however, there is often conflict with other parties competing for the same land. Experience certainly assists in dealing with these types of issues. Describe a typical day on the job I arrive at work just after seven and reply to emails. One day is often very different to the next, depending on priorities and deadlines. 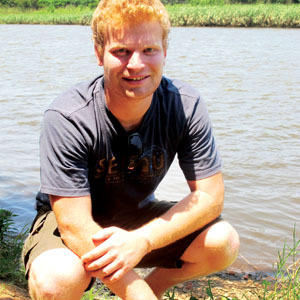 I am involved in a long-term project that aims to prioritise areas for conservation in the eThekwini Municipality. The project requires interactions with scientists around collecting data, field visits and a host of other activities. Time is spent in the field in order to assess the condition of certain areas that are under threat. I also compile reports on the likely impact of the development, which serve as the city’s environmental comment. What do you enjoy the most? Our natural heritage is in a state of decay, with increasing development pressure being placed on our remaining habitats. Every time we conserve an area it is very satisfying, but, more importantly, it represents a victory for the environment. Share some of your future goals I am particularly interested in research and, as such, would like to complete a PhD in the next few years. The outcomes of the study would hopefully be used to improve our management and conservation of aquatic environments. What advice would you give to someone starting out? Work hard at university, the knowledge you gain will be invaluable for you in the work place. It is not a profession that will make you extremely wealthy, but it is one that may provide you with great satisfaction. A Bachelor of Science degree majoring in ecology or other relevant subjects like botany, zoology, microbiology, soil science or geology will prepare an ecology student for entry-level fieldwork or a post as a lab technician, but positions in applied research often require a master’s degree. A National Senior Certificate that meets the requirements for a degree course is a prerequisite. In order to teach or lead independent research, applicants must typically have a PhD in the appropriate sub-specialty. Ecology courses include fieldwork and work experience options. However, it may improve your employment prospects if you do some further work in your own time, for example, volunteering for a conservation charity.